In a speech given at Argonne National Laboratory today, President Obama again insisted the slow movement to end the use of fuels refined from oil is in the nation’s best interest, will spur continued innovation, create more and more jobs, all the while enhancing our national security. The speech was presented at the Argonne site because it was where the improvements in lithium ion batteries that made all the new plug-in hybrids hitting the market possible. 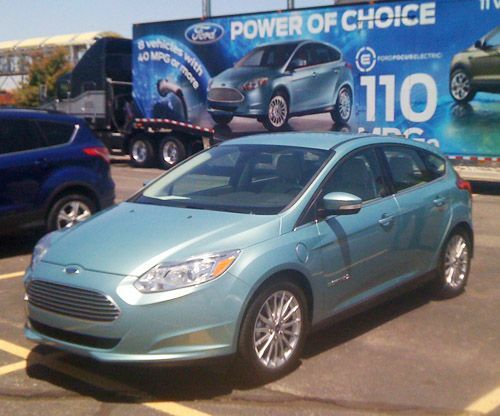 Vehicles like the Ford Focus Electric, pictured here. “So I chose Argonne National Lab because right now, few areas hold more promise for creating good jobs and growing our economy than how we use American energy,” President Obama said. The President then cited the approval of the first new nuclear power plant in 30 years as more evidence of progress in taking charge of our energy choices. The new plant will be built in Georgia, despite concerns about natural disasters like the one that damaged the Fukushima site in Japan during 2011. A partial meltdown of the reactor core at Three Mile Island in 1979 put a chill on the industry for a very long time. Though its not irrational to still have concerns about the virulent toxicity of the consumed power rods, at least it is much cleaner in atmospheric terms than the coal fired plants that are slowly giving way to the wind, solar or natural gas based generation of power. Of course some of the speech was political as Obama pointed out how the sequester blindly reduces spending with no rhyme or reason to the process. One of the things that will suffer (so a few hundred thousand people with astronomical incomes can hang on to more of their money – of which they already have plenty) is funding for the research that drives innovation and keeps America a leader in technological advancement. The first president, George Washington, eschewed political parties, envisioning a despotism evolving out of views colored by ideology. We usually only recognize this in those we term fanatics and zealots, but does such categorization now apply to our two party system. The greatest change in our political landscape over the last fifty years has been the growth of the independent voting block, varyingly reported to be from 30 to 44 percent of the voting public. Could this be a rejection of the strictly ideological view of everything? The argument between our two parties is essentially the one that began in the time of Washington – the role, scope and size of the federal government versus the rights, responsibilities and sovereignty of the states. Such folks may then call you unpatriotic simply because you fail to recognize their elitism. “They don't trim the fat; they cut into muscle and into bone – like research and development being done right here that not only gives a great place for young researchers to come and ply their trade, but also ends up creating all kinds of spinoffs that create good jobs and good wages,” Obama stated, regarding the cuts resulting from the sequester. Four years ago the American auto industry was flatlining – today America is building some of the most efficient, innovative and technologically advanced vehicles in the world. That is a direct result of the effort to take charge of our energy usage. Though he would like to take credit, Obama admitted this policy was not an original idea of his own. The recommendation come from an organization called Securing America's Future Energy (SAFE), headed by FedEx Corp. Chairman and CEO, Frederick W. Smith and retired Marine Corps Gen. P.X. Kelley. The group Obama characterized as, “a non-partisan coalition that includes retired generals and admirals and leading CEOs,” considers reducing US oil dependence to be imperative to the country’s continued wellbeing. Obama was given a tour of the facility by two of the leading researchers, Dr. Isaacs and Dr. Crabtree. During the speech, Obama quoted Dr. Issacs as stating: "This sudden halt on new starts will freeze American science in place while the rest of the world races forward, and it will knock a generation of young scientists off their stride, ultimately costing billions of dollars in missed future opportunities." Many of the super-rich simply move out of the country to avoid paying more taxes to the system and nation that enabled their success. Maybe the rest should follow suit, allowing those of us remaining to take of the party glasses and look for the common good. It’s a ridiculous idea, I know, but not so long ago, so was the notion a metal bird could fly through the air. This page is updated on April 12, 2013. And just who or whom is going to pay me to buy a new car that doesn't run on gasoline? Being someone on Social Security, I can't afford a new car now or at anytime in the future. Seems we need to start with the CEO's of the big oil companies and ask them to take huge pay cuts, say, to $400k a year instead of making $40 million. That would drop the pump prices, too. I shrug every time we read of a CEO getting a "bonus" ... and just what was this "bonus" for? For sitting in an ivory tower in front of a mahogany desk with fancy pen holders??? Did they actually "work" for that bonus ... I mean toil of hard work and sweat? Doubt it. The top job in this country is the President of the United States. No one person should or needs to earn more in salary than the top job in the US. That's "earn more" ... not what they make in investments, etc, but actual "wages" paid by the company whom they are employed. How about we start with China who is polluting the air ground and water. Our fossil fuel plants here in the United States arent the cause of this so called global warming. The Fossil fuel plants here are actually working on cleaning up their act by installing better scrubbers, better bag houses, better Low NOx burners. Why should we shut down our inexpensive fossil fuel plants and damage our economy to make a statement of "See what we're doing? Now its your turn." especially when China could care less about the environment just as long as they are making money hand over fist. Is every other country afraid to put pressure on China to clean up their act? Are people really that blind and stupid to believe Obama when he says clean energy creates more jobs? I work in the industry of making electricity my plant employes around 350 people. There is a wind farm just south of where I work that employes about 12. Do the Math... Also that wind farm makes about 20MW of electricity and there are about 40 wind generators spread thru out the valley south of me. My plant has four units and produces 1,000MW combined and takes up the space of one city block. Can you imagine how many wind generators it would take and also solar panels it would take to cover the lost energy of Fossil fuels and how much land it would take to put wind and solar in? People will never stop crying and complaining.. Now its Fossil Fuels are bad shut em down, later it will be Solar and Wind are taking up to much land and are an eyesore. blah blah blah..
China is already concerned with particle emissions and will have to deal with it on their terms. Just because your neighbor lets their yard go to the dogs, should you? As far as wind farms go, you are overlooking all the manufacturing jobs and construction jobs those projects produced. Lastly, please read the link on the potential of solar energy. Otherwise your argument comes down to, “I don't like change.” That's an understandable opinion, but as Jeff Airplane put it: “Life is change. How it differs from the rocks.” The rocks you are burning were once life too, but now they cause an imbalance and forgive me for finding it hard to believe the filters and scrubbers you mention are much more than corporate hype. I could be wrong. I am adding a link to a post on China just for you. Thanks for your input!